The perfect finish to your special day, these pink Ceremony court shoes from Dune’s Bridal Collection offer elegance and sparkle. 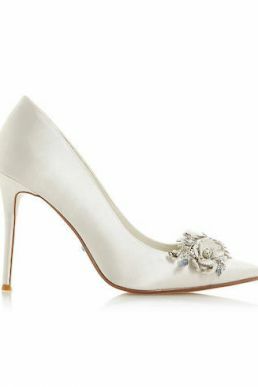 Set to a high stiletto heel, this shoe has a slingback strap and slopes into a sleek pointed. They are decorated with a pretty wreath brooch at the toe for an eye-catching touch. Not forgetting your something blue, the pair is finished with a pretty blue jewel on the sole.